I’m always on the lookout for delicious and healthy Weight Watchers Slow Cooker Recipes, because, let’s face it, cooking in a crock pot pretty much rules. With a toddler at home and a baby in my tummy causing horrible morning sickness, I LOVE the idea of throwing some food in a pot and calling it dinner! 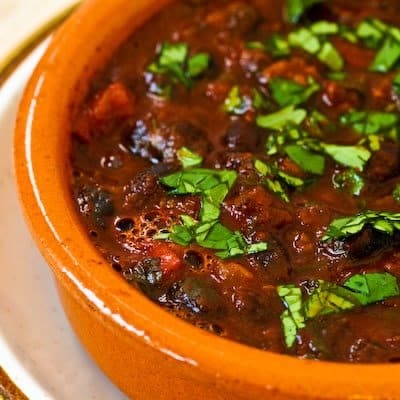 This amazingly yummy Mushroom and Black Bean Crock Pot Recipe was so good! Loaded with flavor, spice and texture, this chili was way more enjoyable than I anticipated. It’s also packed with protein and fiber, and very low in fat, making it easy on the WW Points. It’s a great, healthy alternative to traditional Mexican foods, and still brings that authentic Mexican flavor. This is also a great dish to serve for a crowd or large party, and is sure to fool everyone into thinking it’s fatteningly delicious! An incredibly hearty and easy vegetarian chili recipe, perfect for a family meal. It’s a healthy alternative to traditional Mexican food, but still delivers authentic Mexican flavors. Combine oil, mustard seeds, chili powder, cumin and cardamom in a 5- to 6-quart Dutch oven. Place over high heat and stir until the spices sizzle, about 30 seconds. Add onions, garlic, mushrooms, corn, jalapenos, zucchini, tomatillos and water. Cover and cook, stirring occasionally, until the vegetables are juicy, 5 to 7 minutes. Add broth, lime juice, tomato paste, salt & pepper and chipotles; mix well. Place the beans in a 5- to 6-quart crock pot or slow cooker. Pour the hot vegetable mixture over the beans. Turn heat to high. Put the lid on and cook until the beans are creamy, 5 to 8 hours. Garnish with cilantro and diced tomatoes right before serving. Great recipe! And website. Keep these recipes coming! This chili was great and oh so easy to make. It also freezes well. I just added a bit more broth to each frozen portion. I had super hearty lunches all week! And for barely any point. I can't seem to find mustard seeds. I this crucial to the recipe? Can I substitute ground mustard? If so, how much? I haven't tried it without the mustard seed, so I can't vouch for the taste. But you can try by substituting with a tbsp of dried mustard instead or 1/4 cup dijon mustard. It will not affect the Points + Value. Give it a shot and let us know how it goes! My parents are coming over for dinner next week. I'm going to try this recipe out on them. Can't wait!! Hope you feel better with the morning sickness! I had it bad too. 16 weeks was my magic marker for it to end.